We are so excited to announce a new Bible Study for a new year! The Symphony Studies Bible in a Year Reading Plan is now available. There is an excitement in my heart as I get ready to read the Bible in a year. I would love for you to join me! Feel that the task is too daunting? Yea, me too, until I developed a reading plan that is easy, minimalistic and gives you freedom. Read on, my friend, read on! WHY DID YOU DEVELOP THE SYMPHONY STUDIES BIBLE IN A YEAR PLAN? Every January I try to start a “Read the Bible in a Year” plan. With the best intentions, I pick on of the hundreds of plans from chronological to historical. I have tried most of them. I download or print out my plan and start on January first with excitement to read the Bible in a Year. By March first, I’m already weeks behind. I am embarrassed to admit that I have yet to complete a Bible in a Year reading plan. Part of the problem is my will and my desire. I Inscribe the Word daily, but to just sit and read is hard for me. I know I have to humble and submit myself to the task, throwing away distractions and noises. But the other part of the problem is that the reading plans are really dull. "Day 1 read this. Day 2 read that." I feel like there is no fluidity to the plans I have tried. I am reading the passages just to say I checked it off the list and as a result, I am not taking to heart what I am reading. This year, I want to change, and I want to say, come December 31, that I have read the Bible in a year! I researched many plans trying to find one that I can commit to. I wanted to discover a reading plan that I could really dive into, and not just a list of checkmark boxes to complete. The Bible isn’t something I want to check off of my to-do list each day. It is a manual for life that I want to infiltrate my body, mind, spirit, and soul. After much research, I decided to write out my own plan that would help me stay focused on what really matters when studying the Word. I hope you will join me this year as we read the Bible with the Symphony Studies Bible in a Year Plan. The Symphony Studies Bible in a Year Plan is a Bible reading plan that will take you through Genesis to Revelation in one year. HOW IS IT DIFFERENT FROM OTHER PLANS? The goal is precisely the same as any other reading plan; to read the Bible in a year. The method is different. Instead of a list of checkboxes of Day 1 read this . . . Day 2 read that . . . The plan is divided into the genres of Scripture by month. As you read the Bible, it is so important to understand what genre of Biblical Literature you are reading. Are you reading a book of Hebrew History or Poetry or The Law? I discuss this in more detail HERE. This plan gives you more freedom than other plans I have tried. If you want to read the book of Genesis in a day and then re-read it again before the month is up, you can do that. If you only have time to read one chapter one day but know that on the weekend you can read ten chapters, you can do that as well without feeling that you are behind. It is minimal in design and gives you freedom. You can download your free EBOOK at the end of this post! Ideally, you’d start on January first, but in reality, you can begin at any time. If you are finding this plan in March, then just start with March. If you are seeing this in June, then start your year in June. Again, freedom, my friends! Don’t worry about the when so much as why you are doing it. Start where you are when you can. There is no right or wrong way. 1. You need a Bible. If you want to know my favorite translations and the exact Bibles I use, CLICK HERE. For this study, I am using the English Standard Version. 2. You need a copy of the plan. I have created a FREE booklet for you at the end of this article that you can print and download. It includes the exact plan I will be using. 3. A willing heart and an open mind. Get excited, my friend, about reading the word this year. Pray that the Lord would give you excitement to dig deeper into His word. 4. A time that is your own. Schedule time to make this happen. Whether it is on a lunch break, at night before bed, first thing in the morning, whenever, but do not let anything get in the way of the time you have to read the Bible in a Year. WILL YOU STILL BE DOING YOUR INSCRIBE THE WORD PLANS? Absolutely! And this year, they will be tied to this reading plan! So if you are Reading the Word with us, you can also Inscribe the Word with the Symphony of Praise plans. Oh, yes I will, my friend. 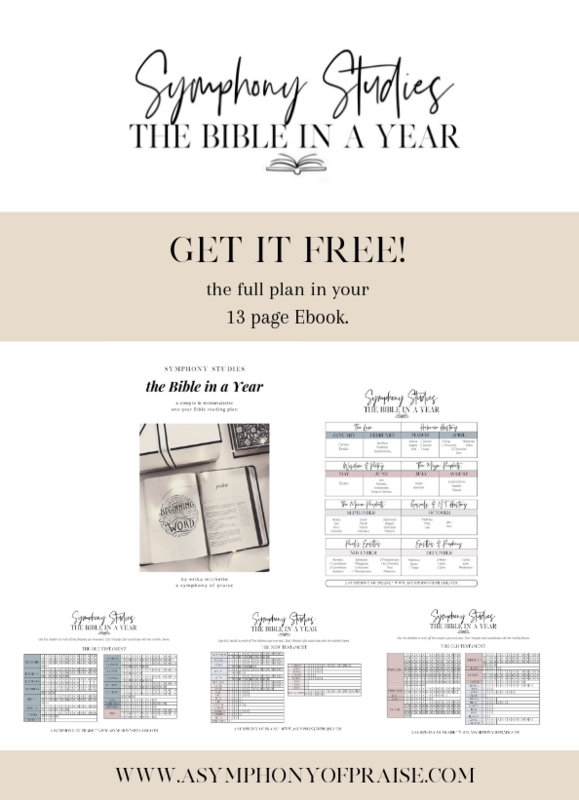 When you download the plan at the end of this article, each month you will get an email from me letting you know what comes next, giving you some relevant facts about the books we are reading, and even some fun downloads including wallpapers for your phone, and printable. I promise to hold you accountable if you promise to really make this a focus of your new year! CLICK HERE for your plan. Check Your Email for the link to download. I can't wait to take this journey with you! Awesome. I cannot wait to read the Bible with you this year. Again, this is a FREE plan, it won’t cost you a thing. To download your free SYMPHONY STUDIES Bible in a Year Reading plan, fill out the form below and look for your first email from us. That email will contain your plan and everything you need to get started. Our official start date is January 1st. But again, if you are reading this any other time of the year, sign up, get the plan, and start where you are! Now, do one more thing. SHARE THIS with your friends and family. Get others on board. Get your kids on board. This is an excellent way to read the Bible together. Share the link, email it, Facebook, Instagram, and Pinterest it!